Guess what? We may be getting another hurricane! Today, I want to talk about generator uses for safety and fun. Wouldn’t you know just when it seems we’ve made it through hurricane season unscathed, a new storm forms and is tracking to pass near us or maybe at us! As usual, the timing is perfect (NOT) since I’m still recovering from shoulder surgery and can’t do anything with my right arm yet. With that in mind, I thought this would be a great time to mention the importance of being properly prepared for disasters and how important it is to you and your family. Of course, I think there are several other ways to use a generator besides restoring temporary electricity to your home. Several make having a generator a very convenient thing if not fun. I’ll share a few of my favorite fun generator uses below too. Sending out a big thank you to Ryobi Outdoors who has sponsored this post. Thank you for supporting the brands that keep H2oBungalow going. Ultimately, I think the strongest reason to have a generator is safety. There are many areas within the United States and abroad, are prone to some type of a natural disaster. Most have the potential to knock out power for extended amounts of time with severe wind, snow, floods, earthquakes, tornados, etc. After last year’s Hurricane Irma, I shared my experience of living where the storm hit. It was a tough time for my family since my sister lives in Puerto Rico and we live in Florida. For three weeks in a row, we had a family member in harms way living through a category 4 or 5 hurricane. It was a crazy time and stressful! Thanks to my sweet husband who diligently keeps our hurricane kit stocked and up to date, we were prepared with storm and emergency supplies. If you don’t have an extensive emergency preparation checklist yet, take a look at ours. You can modify it for your needs. It has several items listed that I wouldn’t have thought about but would be necessary if we were to live through a huge disaster. See what our place looked like after our last hurricane and get my Free Extensive Hurricane Preparation Checklist in this post. I also shard some of my favorite links to products I couldn’t live without in an emergency too. You have no idea how much you need to be prepared for during a major disaster or even if you just lost power for an extended time until you either live through it or have a close relationship with someone who has. Did you know that many households, even in disaster prone hit areas, do not own generators. Can I tell you, after living through a hurricane like Irma, I can’t imagine NOT having a generator. It’s a worthwhile investment. We typically think of using generators to simply restore power, so we can use our heat or in our case, air conditioning, keep our food cold, see in the dark, etc. Did you know there are lots of other generator uses in an emergency as well? We can easily forget all the other potential generator uses in and around our homes during power outages. A generator can also be used to power a heater, or portable AC unit, or open a garage door if the power goes out. 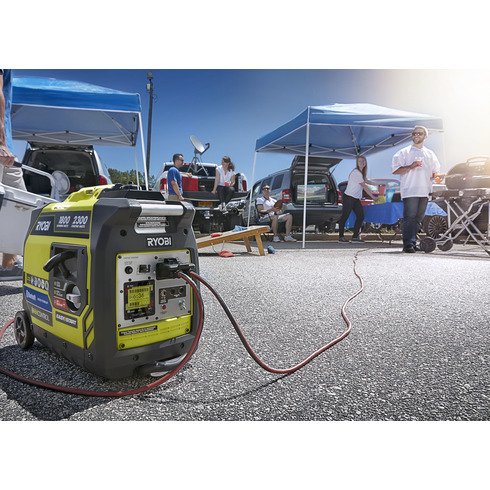 Generators can power an alarm system, and personal medical devices like C-Pap or oxygen machines, or charging rechargeable batteries or cell phones and tablets. Last year in Puerto Rico, my sister’s neighbor hooked up their generator and projected a movie each night on the side of the house for everyone in the neighborhood. It was a welcome relief to take some time out to just sit and relax for many who just needed a break from the stress. You all know I love power tools, and seriously, this could be considered one of the best “tools” I own. Trust me, when faced with a major storm, there’s a great sense of security knowing we have a generator handy, whether we end up needing it or not. Now, I know we don’t have storms or emergencies all year. Maybe that’s what keeps people from buying them, they’re willing to take their chances. But there are so many other everyday uses for a generator that make owning one worthwhile during non-emergency times. They can be used for camping, tailgating, backyard parties or powering equipment or tools outdoors when you’re not near a plug. Let’s not forget using it for DIY projects! 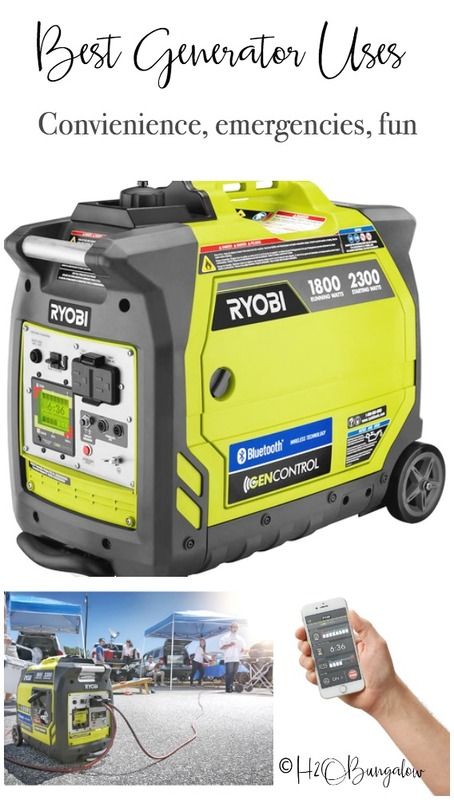 Did you know that Ryobi makes a line of Generators and they can be found at Home Depot? 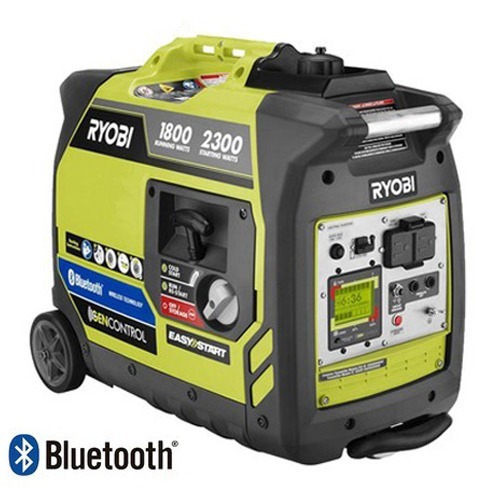 We have the Ryobi Bluetooth 2300 Watt Super Quiet Generator. They make large and small generators, but I love the one we have and would recommend it to anyone. 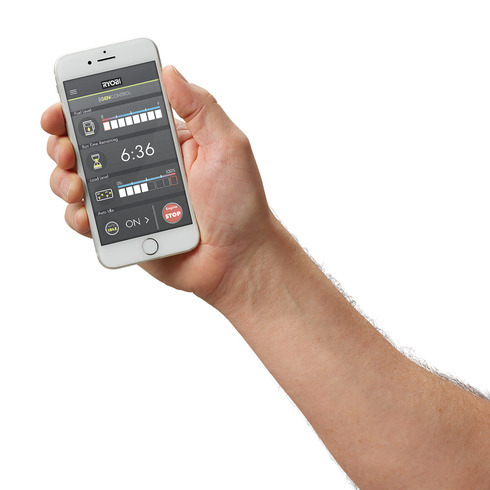 Here’s a few more of the features I love about the model we have. Pin this for later and share this with your friends of Facebook! You guys know I love my Ryobi tools and trust the brand. 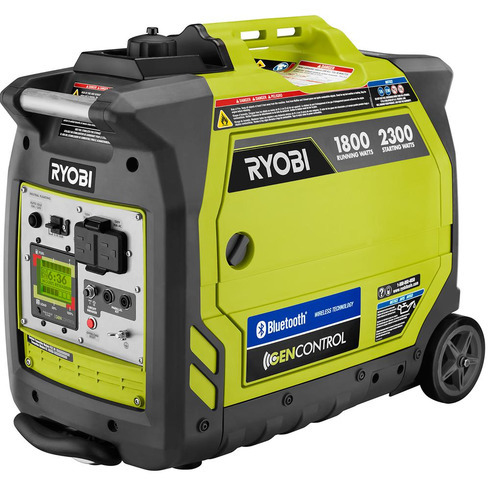 I chose to get a Ryobi generator because I felt confident it would help keep my family safe and supplied with power should we need it. Do you live in a disaster prone area and do you own a generator? Leave me a note in the comment section below!